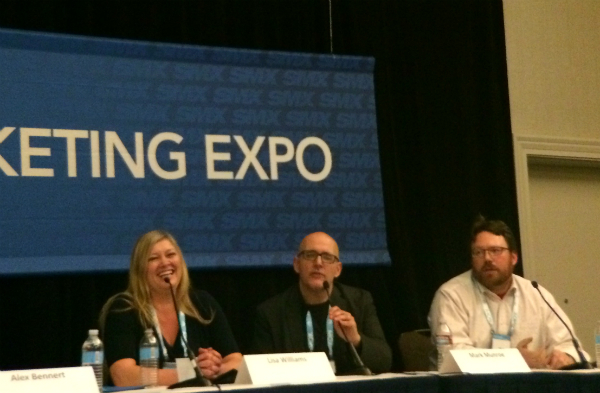 At this SMX West session, our esteemed speakers talk of conversion SEO, emphasizing that the role of SEO doesn’t end at getting traffic to the site. You’ll read about one speaker’s vision to “think about SEO not as search engine optimization but as search experience optimization” and get UX recommendations through streamlining the checkout process to surveying search visitors. 1. Have a great product or service. This makes a difference for conversion. Your sucking and being bad at what you do will ruin your business. Obvious, sure. But be proud of what you do and what you have. If you’re not doing this, what the panelists share today won’t help. 2. Laser focus your goals and assets. Focus your lead generation, brand awareness, engagement, lead nurturing, sales, customer retention, evangelism. Search isn’t just search engines. Think about SEO not as search engine optimization but as search experience optimization. That’s the one biggest wish she has for the industry. SEO and topical assets: Know the location of all campaign assets and how you can optimize them for a topic/category. This includes landing pages, posts, videos, PR, product and other schema, social sharing structured data. Duane Forrester implores us to think of SEO and usability together. Do people on your marketing team understand how much SEO impacts usability? When doing focus group testing and user testing, make sure that data is passed along to the SEO. 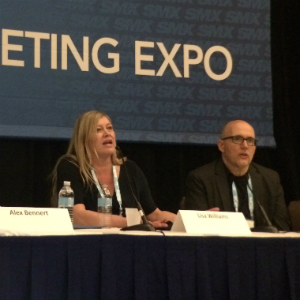 Marcus Tober, founder of Searchmetrics, dives in to how search affects mobile. Yes, SEO impacts mobile, but it’s important to note that engagement (like task completion) is very different on mobile. Cisco projects that in 2017, Americans on average will own 7 devices. Jonathon Colman, content strategist for Facebook, says that SEOs have work to do making sure that everyone in a marketing team understands that the things that align us are far greater than the things that are different about us. Developers, programmers, user experience optimizers, content strategists and SEOs are all working toward the same goal. Our users are interacting on lots of different channels and don’t convert on the one they’re on now. Model and build out your scorecard/dashboard before campaign launch (for more details, see Lisa Williams’s post). Use storytelling (numbers and words). 5. Ask for feedback and advice. How you got them to a landing page? 7. Agree on what success looks like. When your visitors are happy with your site, search engines notice. It may not be worth obsessing over how they notice as much as that they do. 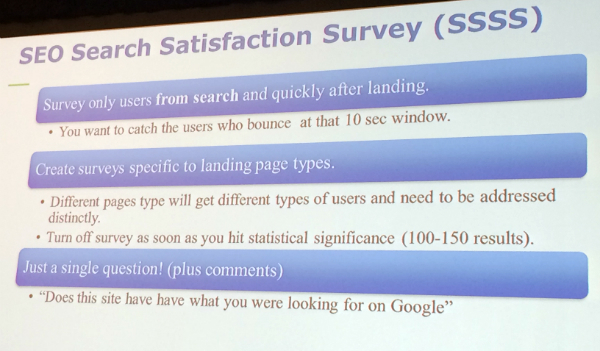 Long-term SEO success is a happy Google. Google wants to “kill the search” and have the user go on to the next search. Don’t sacrifice the broad user experience at the expense of conversion. If you look at your traffic-driving keywords in Google Webmaster Tools, you see a mix of customers, prospects and drive-by traffic. We typically focus on our prospects and customers, but we should also worry about everyone else. Interstitials are an example where the focus on conversions satisfies a few at the expense of many. Google isn’t a fan of interstitials, saying they may be “too disruptive to the user experience of the site.” A quick abandonment and bounce back to Google doesn’t look good for your site. An interstitial bounce is even worse for you than a regular bounce. 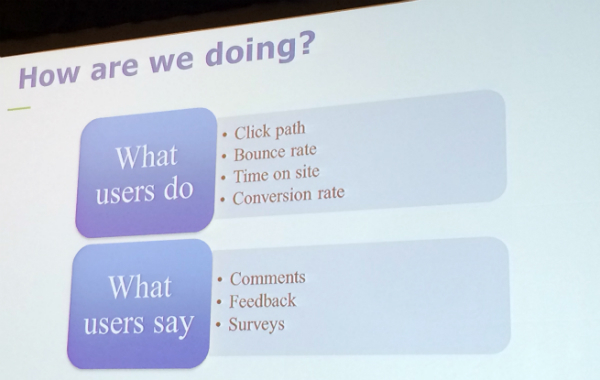 To find out what users say, you could ask and you could do surveys. Net Promoter Score (NPC) is an index ranging from -100 to 100 that measures the willingness of customers to recommend a company’s products or services to others. Is NPC good for SEO? He had a client who couldn’t understand why they were hit by Panda when their NPC was 65. They asked their customers (the most likely group to like them) and not their site visitors whether or not they had a good experience. On a site that was hit by Panda, he surveyed visitors to the site coming from search, asking a single question: “Do you think this site has what you’re looking for on Google?” About 58 percent of the respondents had negative feedback and comments. The site team continued to build and refine their survey as they got more information. Create a survey based on your hypothesis. Keep one open question to catch what you missed. If you’re missing something important, adjust and restart the survey. If there’s a disconnect between what users want and what you have, partner with someone to bring that information to your site or send the user to a place where they can get it. You want to continue the user along their journey even if you don’t have the info. Have you ever gone to a website that’s really slow to load? Whose fault is that? It’s the website manager’s fault. That could be the CEO or CTO and the developer. Fast is where it’s at. How fast is your site? How fast should your pages load? He says that you want to get to a load time between 250 and 300 milliseconds. He does code audits all the time to remove code bloat. http://robhammond.co/tools/wmt-crawl-stats: Export the crawl stats from GWT as a csv file. How many think that SEO involves getting people to the page and then your job is done? Move on to conversion SEO. Once you hook the fish, what’s next? Most sites make you log in or register, enter shipping info and verify stuff, then enter a credit card and then verify your purchase. Make it simple. Apply your SEO principles to your checkout process. Think through the logical mindset of your user. Look at your drop-off rate and abandonment rate. If you address the cart/checkout process, you can increase revenue. The hardest thing to get? The credit card number. Plastic is hard. The user has to get their wallet. Be sure you’re designing the shopping process for women. Most developers are men and don’t consider that a lot of online shoppers are women. Spanx (1 step to Paypal / 5 steps on site) and Art.com (3 steps to Paypal / 7 steps on site): These sites had the best checkout process he could find and he spent hours looking. Offer to get email spam. No reason to lose the golden opportunities that are ready to be plucked from the earth. I read your blog. It’s interesting to see how long this specific post has been generating responses. I look forward to putting your ideas into action. Thanks for sharing such an innovative post. I Hope it really helps me for my blog.